Infuse your skin with some Moroccanoil wonderful-ness! 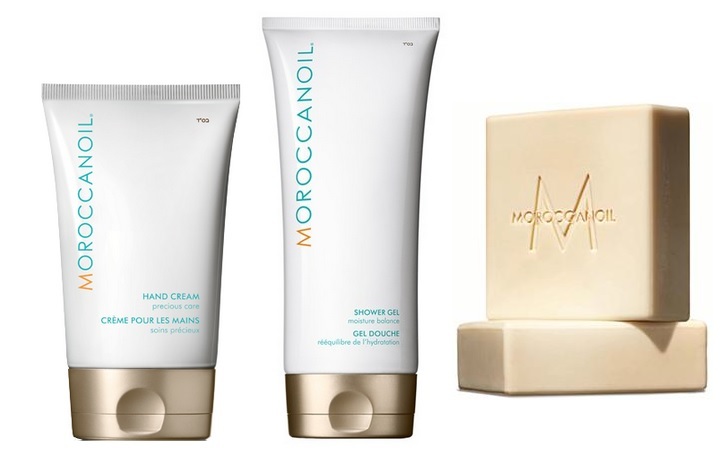 Love how soft Morroccanoil leaves your hair feeling and way the signature scent perfumes your hair? Why not let it do the same things for your skin with a few products sure to leave you feeling soft and smelling pretty! Moroccanoil Hand Cream - 125ml - $28 - slather your hands with antioxidant-rich argan oil and natural emollients in a formula also abundant with cocoa, shea and avocado butters that offer intense hydration and an increase in elasticity and strength of skin, cuticles and nails and the brightening power of citrus to restore skin's radiance for a luminous, healthy finish. Don't like slimy hand creams? No worries here, this one is rich yet lightweight with no greasy residue - use it as many times a day as you need to! Moroccanoil Shower Gel - 200ml - $26 - with a decadent gel formula that is chock-full of antioxidant-rich argan oil that hydrates the skin as it cleanses along with glycerin in a highly concentrated yet mild formula that works to immediately restore skin's optimal moisture balance - improving elasticity, texture and tone for skin that is left refreshed and revitalized. Moroccanoil Cleansing Bar - 110g - $10 - this mild cleanser unites healing, deeply reparative argan oil and lush shea butter to wrap skin in essential antioxidants and tons of moisture for skin that is soft, cared-for and never dry. Available now at luxury spas and fine salons across Canada including Quartz Crystal Spa at the Trump Hotel in Toronto, The Spa at Fairmont Chateau Lake Louise, Spa Vida at Sheraton Wall Center in Vancouver, Victoria Park Spa in Montreal and The Spa at the Four Seasons Toronto. I loveeeeeeee the cleansing bar!